Geology See British Geological Survey England and Wales Sheet 41 Richmond. The uppermost strata of Cringley Hill and Calver Hill are the Richmond Cherts and the Main Limestone. The Middle Limestone outcrops on the Dale sides below Riddings Farm. Record Description References RTH01- are to the Sites Numbered on the SWALB EDM survey plan with later additions, Laurie et al 2011. 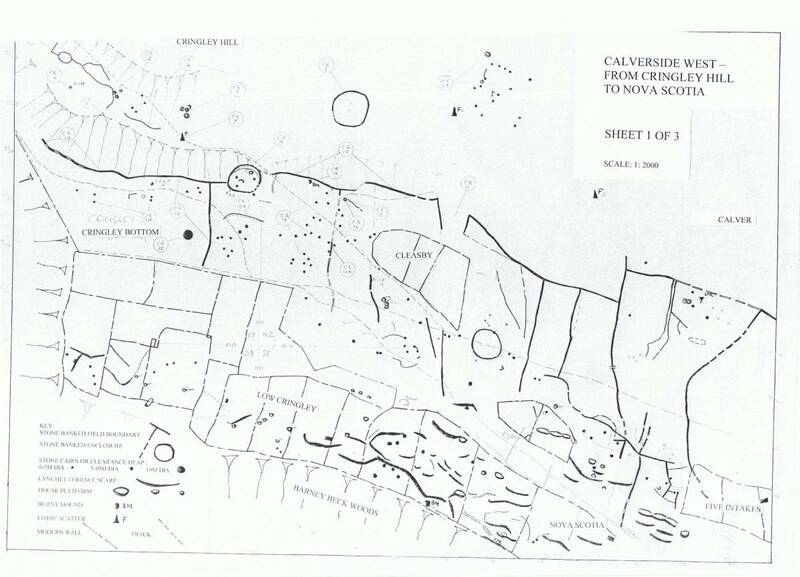 For the full survey and and introduction to the Cairnfield Settlement Complex, the Coaxial Field System below Cringley Hill (Calverside West) and the settlements within the Barney Beck Pastures (from Nova Scotia to Low Cringley) see SWALB Survey attached and Laurie et al 2011. Cairnfield extending from Fore Gill eastward to, beyond and below Cleasby Intake within the area of the coaxial field system recorded separately in this database. At least 75 stone cairns, usually more or less reduced by quarrying. 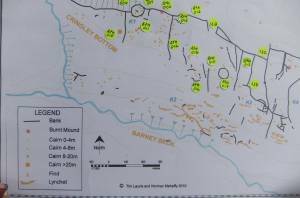 This cairnfield survives on open moorland above the enclosed Barney Beck Pastures and are associated with short lengths of irregular field walling which are unconformable with the organised coaxial field boundaries (RTH012). 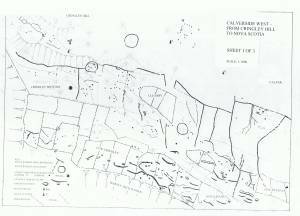 For record purposes, it has been assumed that the isolated large round cairn (RTH010) the cairnfield and the associated irregular field banks(RTH011) the Burnt Mound (RTH 006) represent the earliest phase of agricultural activity at Low Cringley and that the curvilinear enclosures (RTH005 and RTH 00*)and the co-axial field systems (RTH012 and RTH01*) represent a subsequent more managed landscape. Most of the cairns have been slighted by subsequent, probably recent, stone quarrying however it is significant that several cairns located at very close proximity to coaxial field banks have NOT been reduced to form the banks and therefore that the coaxial field system may have developed from the cairnfield stage of occupation. All features other than the cairnfield and the associated short lengths of irregular field banks are recorded separately. 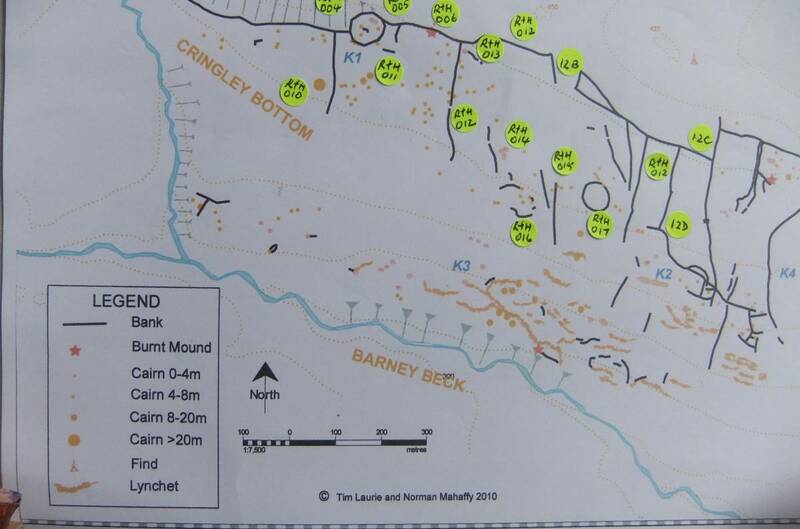 The slight remains of the very large 19m diameter round cairn situated close to and quarried away for the modern pasture walls above Low Cringley Farm are recorded separately as RTH009. The two 8m diameter circular cairns which are relatively undisturbed at NY99765 00306 are photographed and identified separately as RTH011A and 011B as they are relatively well built, are distinctive and have visible kerbs. No archaeological features are mapped within the walled pastures at Cleasby Intake, however it may be assumed that the cairnfield once extended across these pastures also. Image 1 Description Calverside West. SWALB EDM survey plan with later additions, Laurie et al 2011. Image 2 Description Calverside West. SWALB EDM survey plan, Laurie et al 2011.